Plantcatching has been carried for four years by one person alone. To develop and maintain a complete website for sharing within the realm of horticulture and urban agriculture, often adding functionalities requested by yourselves, is an enormous amount of time. Seeing it progress is a passion of mine, and I would love to be able to support it financially myself. Unfortunately, I’m running out of resources and without your help, I won’t be able to keep it going. Plantcatching will come to a stop, a victim of its own success! Launched as an experiment, Plantcatching now works very well and has the potential to grow into not only a strong network between gardeners, both locally and around the world, but into a huge commons of plant resources. It is the only citizen platform that is sufficiently whole to reach this potential, and you are among the thousands of people already using it. Instead of running an online funding campaign like a Kickstarter, which is very demanding and temporary, I decided to invest my time into building interesting functions that are useful to you on a daily basis. On the side, I also created Bamboo Accounts with paying gardening professionals in mind and although close to twenty have registered so far, it is not nearly enough. 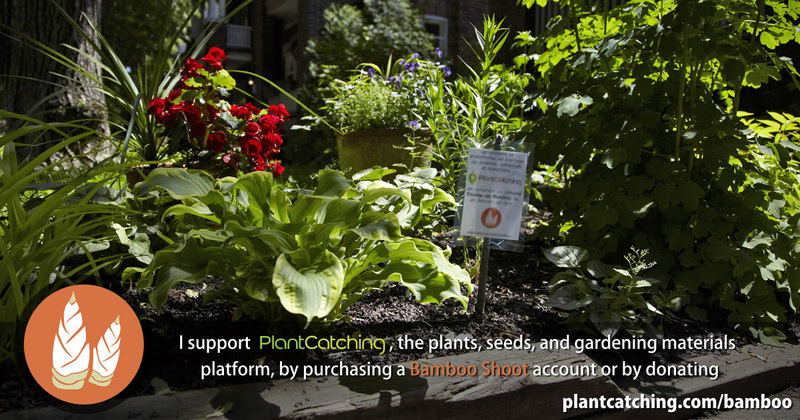 Since many of you expressed interest in supporting Plantcatching last year, I created the Bamboo Shoot account to cater for home gardeners. As soon as something becomes available within a radius you specify, you receive an email alert. You can even filter results with keywords. Search for keywords anywhere in the world. You thus have tremendous oportunities for sharing seeds, cuttings, seedlings and more with thousands of gardeners. What’s more, you can build two convenient lists of plants: those you’re offering and those you’d like to have. On Plantcatching, there has always been a 15-minute delay between the time a listing is created and the time it is published online. With your account, this delay is eliminated and you see them appear in real-time. You have more space to formulate your request and to build your profile. In this growing community, it is useful to have a cleary recognized identity; this account allows you to use custom avatars. Develop a website completely rebuilt for phones and tablets (many of you have requested this). Develop a citizen pinboard for geolocalized projects, activities, etc. Update the administrator side of the site, which has lagged behind compared to the user functions that have been improved over the last year (solid admin tools are necessary to bring you the best online technical support and security). Pay for the website’s hosting and database storage. Pay for domain names for many years ahead and to keep online payments secure. Protect against the closing of Plantcatching while keeping citizen priorities as its mission and vision. Plantcatching is YOUR platform; the gardeners’ platform. Please support it by registering for a Bamboo Shoot account and by sharing the page dedicated to this campaign throughout your social networks, online and offline!